Shortest love story : In love with shah rukh khan is the shortest love story in book format I have ever read. Its the cutest looking book ever, period! Its a collector’s item: If you are someone who not just likes to reads but also collect different kind of books, then you should definitely buy this one. Treat for Shah Rukh Khan Fans : All you fans out there have you never dreamt to meet the man himself? If, yes then do read this book, you will surely like it. 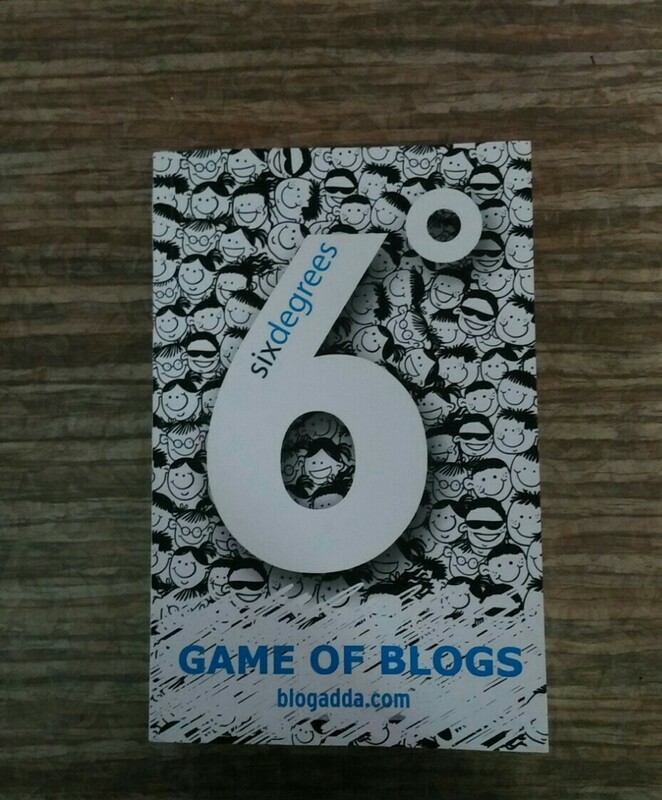 As part of their #CelebrateBlogging initiative, BlogAdda.com, ran the first edition of Game of Blogs in September 2014. Five characters and their descriptions were provided. The objective was to write a fictional story revolving around these characters. Bloggers came together as teams and after three rounds filled with its own set of twists and turns, three stories made it to the end. The three stories in this book are a fascinating example of how one set of characters can have interesting lives with completely different dimensions. Six Degrees is a result of how collaboration can truly breed creativity in the modern day world of connected living. I was tagged by Mark Jayson Balas of bongbongbooks for this book tag long back but couldn’t finish this task . Better late than never, I guess. So lets begin with questions. Yes, my Bedroom where my study table is. I mostly read in my bedroom. Sometimes I read just before sleeping ,so my bed is second spot where I read in my bedroom. Bookmarks. mostly! I do own few bookmarks,the metal ones and paper ones too. I do carry a bookmark whenever i am carrying a book. I like to stop when a chapter finishes rather than on random pages. This also works for short stories well, so I am very particular about it. It’s easier to remember where you last stopped in the story. In rare occasions when I stop reading in between chapters , I start with re- reading that chapter. Sometimes. I am one of those people who are super clean while eating, so I am not worried about my books getting dirtier. once my friend borrowed a book and returned it with yellow food stains. I am yet to forgive her for that. Music is good company but tv is distraction. There was a time when I couldn’t read more than one at a time, but presently, I am reading 4. I read when at home,office and while travelling. I do carry a book along most of the times,unless I am going out with friends and family. I do skip pages if the book is boring or the plot is getting typical. Preserving it like a new copy all the way! As I mentioned earlier, I am a super clean person, I wrap books in plastic after I am done reading so they remain brand new always. I don’t write, but yes if I find a beautiful quote or if a line strucks me I highlight it. I hardly have blogger friends,so I am gonna tag few friends who also blog. Here’s the list of wonderful people I tag. Pls, do tag me once you are done answering the questions, i’d love to read them. Thank you so much Mark for tagging me, it was really fun task to complete. Since launching her writing career, Kaylin McFarren has earned more than a dozen Literary awards in addition to a finalist spot in the 2008 RWA Golden Heart contest. A member of RWA, Rose City Romance Writers, and Willamette Writers, she also lends her participation and support to various charitable organisation , as well her own foundation benefiting cancer research in the pacific northwest. McFarren currently lives with her husband in Oregon . They have three daughters and two grandsons and enjoy travelling the globe and making monthly visits to their second home in California. Rachel Lyons and Chase Cohen decide to visit Rachel’s uncle – Paul Lyons in London to take his blessings for their impending marriage. With Rachel’s pregnancy sickness worsening day by day and Chase’s fears growing of losing Rachel, there’s trouble in paradise. Things turn worst when they reach London and find themselves involved into a mystery, mystery of stolen paintings from Paul’s Gallery, which everyone thinks his step grand-daughter Sloan has something to do with. Paul is sure Sloan is innocent but Sloan’s absence makes things dangerous. Chase and Rachel get themselves so involved in this mystery that their lives get in danger. While solving this mystery, chasing culprits and trying to save Lyons from bad guys, Rachel and Chase learn the most important lesson of their lives. BANISHED THREADS is third installment in the THREADS series by Kaylin McFarren. Though its a series, one can easily read all the three books as stand-alone without getting confused. BANISHED THREADS is not as lengthy as its successors and that makes it a crisp mystery novel. Author McFarren ends each book with a cliffhanger which works in favour of the genre of the series. Banished Threads was supposed to be the last installment of the series, but Author McFarren has announced a fourth book in the series titled as Twisted Threads which will release somewhere in 2016 End. She promises to answer all the questions Banished Threads has generated in the end. THIS REVIEW IS FOR AUTHOR KAYLIN MCFARREN , THOUGH THE VIEWS STATED ARE COMPLETELY MINE. When indiscipline at Roderick International School, Mussoorie, becomes an alarming issue for members of the Board, educators and parents alike, CEO Jacob Roderick decided to bring in an experimental teacher, Roma Mathur against the wishes of the Board of Directors to curb the growing aggression, hostility and vandalism. Will someone like Roma Mathur, written off by her teachers as a ‘Moron’ and ‘Good for nothing’, be able to inspire learning in students who loath studying and sitting in classrooms? Will this maverick academic, who had been extremely mischievous as a student herself, be able to instill values and discipline in her students? Is there any place for someone as unconventional as Roma Mathur among the esteemed and sophisticated faculty at the prestigious International School? Has Jacob Roderick made a grave mistake in recruiting someone who plays drums, watches Tom and Jerry, beat up Goons in the pub, and rides a sports bike, over the gold medalist, experienced teachers who had applied? What was it the school needed at this desperate hour? It is time for the students of RIS to take a call on what kind of teachers they need in their classrooms. If I ask you what is that one thing/phase of your life you would like to re-live? There is 90% probability one will want childhood, no? and when we talk about childhood we somehow end up talking about school,teachers,subjects,competitions,art fairs,etc.. Our school is one place where we have spent a big chunk of our life-our childhood. Maybe, that’s why teachers are called our second parents. Wanted back bencher & last ranker teacher takes you on a nostalgic trip to past,to your school. As and when a new teacher is introduced your mind starts recollecting which teacher from your school is like this character. There always is one teacher we adored, another that keeps terrifying us throughout our school life, then there’s a teacher who never smiles or the one who sleeps through the classes, one who is so strict that we maintain distance. Our teachers are as important as our parents during the early years. Roma Mathur joins as a temporary substitute for one of the teachers at Roderick International School . She is not a typical teacher material,but that’s not what her problem is. The problem is managing the brats of the classes she is allotted with. Within a week Roma understands she has to treat the tenth graders differently and thus starts her learnings to understand teenage psychology . Every time she has a hard time understanding things, she goes back to her childhood and think from a child’s perspective and yes, there’s always Uttara – counsellor to help her out. The moment she thinks she is doing good with the students,something happens that puts her scratching her head again. Will roma be successful to win over her students completely? Is her approach right? Do we need teachers like Roma? Wanted back bencher and last ranker teacher teaches us simple ways that we can change to understand children/teenagers in a better way. The book talks about scenarios inspired of real life instances happening in the lives of teenagers. Parents and teachers lose patience easily seeing teenagers behave differently day by day and that’s what this book tells us not to. This book can be a great parenting guide. At times the expert talk bores you and that is the only shortcoming from this book. Just as the cover is cute so are the graphics inside the book. You won’t regret reading this no matter you are a parent or not. It’s a fiction tale we all can learn life lessons from. NOTE : THIS REVIEW IS FOR LEADSTART PUBLISHING THOUGH THE VIEWS STATED ARE COMPLETELY MINE. In her powerful, poignant book—one of the best non-fiction works from India in recent years—Anubha Bhonsle examines the tangled and tragic history of Manipur, and of much of India’s North East. Through the story of Irom Sharmila—on a protest fast since 2000—and many others who have fallen victim to violence or despair or stood up to fight for peace and justice, she shows us an entire society ravaged by insurgency and counter-insurgency operations, corruption and ethnic rivalries. Drawing upon extensive interviews with personnel of the Indian army and intelligence agencies, politicians and bureaucrats, leaders of insurgent groups, Irom Sharmila and her family and ordinary people across Manipur, Anubha Bhonsle has produced a compelling and necessary book on the North East, the Indian state, identity politics and the enormous human cost of conflict. Mother, where’s my country? is not just dark but a soul hitting book. After Independence,things have been anything but peaceful for the North Eastern part of India. So much, that the people of north east feel neglected by their own country. the definition of normal life in Manipur is far different from ours. People in Manipur live under threat of Armed forces special powers act(AFSPA). Mother, where’s my country? is your guide to know about Manipur, Irom Sharmila, her protest/hunger strike against the AFSPA in detail. Anubha Bhonsle interviewed close to 200 people in last 9 years to understand the scenario prevailing in Manipur . Her repeated meetings with Irom Sharmila and because of which her staying in manipur has a great impact on this book. This book also highlights the unheard stories of brutality forced upon the common people. Mother, where’s my country? is not for the weak hearted. As the tagline suggest ‘looking for light in the darkness of Manipur’, this book is dark,rough and edgy to the core. NOTE : THIS REVIEW IS FOR BLOGGER REVIEW PROGRAMME. ‘You are what you eat’, is a much repeated adage which is less understood and hardly ever embraced. In the pace and stress points of the modern world, the food that we eat only serves to satisfy our hunger, titillate our tastebuds and in some cases, fill a deep-seated psychological need for security or love. Most often, what we eat has very little connection with what each of us really needs to eat. Hence, Sattvik Foods of India is a cookbook with a deeply significant difference. People are introduced to the fundamentals of wellbeing through the understanding of how each person is different in terms of elemental composition and nutritional requirements. Shattering the myth that healthy food is largely tasteless, this book presents more than 70 easy-to-follow delicious sattvik recipes from various regions of India. Those who are willing to travel down the road to wellness with this book as guide, will not only develop a clearer understanding of the subtle but undeniable connection between right food and wellbeing, but also expand their culinary repertoire. Presented in simple language, this valuable volume is both an engaging read and satisfying to the palate of the serious practitioner and curious reader alike. Sattvik foods of India consists the day to day recipes that we normally eat at home. Its a perfect gift for someone who knows very little or nothing about cooking. Being a Kutchi-Jain I majorly eat Sattvik food in my day to day routine and trust me Sattvik food is as delicious as any other food. Sattvik foods of India can be a good beginners guide to cook great food. The book contains almost eighty recipes starting from snacks/starters,main course, desserts as well as sherbets and chutneys. Recipes are easy to make and the instructions are easy to follow. In the beginning of the book the author gives us a brief about food, the ayurvedic perspective on food,types of foods etc,. This information gives one a general idea about sattvik,rajasik and tamasic diet and how each diet reacts with our body. I liked the way author has kept this part as compact as possible and not boring with too much theory. also, many recipes have mini notes sharing tidbits about history of the recipe. Only downside about this book is,(as i mentioned earlier i am a Kutchi Jain) I not just know but have prepared myself 70-80% of the recipes mentioned in the book before. I was expecting to add more recipes from this book to my knowledge, which I couldn’t. While reading I realise this book is for beginners and not people like me who have been cooking for more than 15yrs. If you have no idea about sattvik food then this can be your guide. Also if you happen to be someone who has never made a cup of tea in your entire life-this book is for you. Yes, this book contains a recipe to make tea too. THIS REVIEW IS FOR LEADSTART PUBLISHING , THOUGH THE VIEWS STATED ARE COMPLETELY MINE.